LAS VEGAS – Reigning reserve world champion barrel racer Carlee Pierce is hanging up her riding boots … for the time being. Pierce, a two-time Wrangler National Finals Rodeo qualifier from Stephenville, Texas, has decided to take a hiatus from ProRodeo. How long she will be sidelines has yet to be determined, but Pierce will take some time away from rodeo trail to focus her attention on her family. “I won’t rodeo without my family,” said Pierce, a Canadian-born cowgirl who was raised in the northwest Oklahoma community of Freedom. “This year my three kids do not want to go, and they want me to stay home more, not just a few days at a time. Pierce has earned $34,003 this season and sits No. 3 in the Women’s Professional Rodeo Association world standings as of June 3. 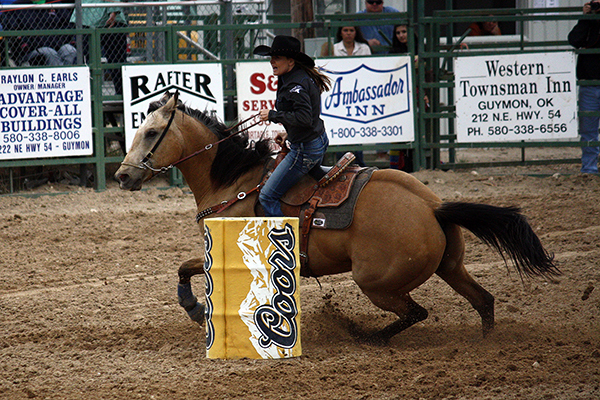 In addition to being one of the top cowgirls in the game since 2011, she also has a barn full of talented horses, including Rare Dillion, a 14-year-old buckskin gelding, which has been a guiding force behind her drive to the top. But she’s also had the unwavering support of her family: husband, Steve; son, Kale; and daughters, Makala and Jacy. Over the past two summers, the rodeo trail also served as a family vacation. “To make the NFR takes a lot of sacrifice,” Pierce said. “I’ve given up time with my family, and my family has given up things they want to do.